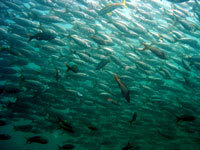 The Cabo Pulmo National Marine Park is home to the best scuba diving in the Los Cabos and Cabo San Lucas areas. Cabo Pulmo is home to the only living coral reef on the west coast of North America, and is home to a wide array of marine life, including over 350 different species! Cabo Pulmo is located about 1.5 hours north of Cabo San Lucas, Mexico, and is home to the clearest water in the Sea of Cortez, with visibility over 100 feet during the late summer and autumn months. 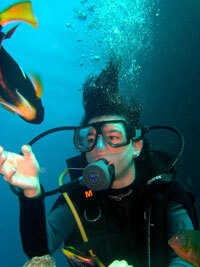 Dive Sites: Sea Lion Colony, El Bajo Reef, El Cantil Reef, El Islote, Los Frailes, Tuna Shipwreck. See our Dive Site Descriptions..
Cruise Passengers: Sorry, this tour is too early for most cruise ship schedules. If you're in doubt, ask us. Free pickup at your Cabo San Lucas, Los Cabos Corridor, or San Jose del Cabo hotel. Open Water Certification. Not certified? Click here. If you have a snorkeler in your group, they can join you for $125.00 per person, however snorkelers will go in a different boat than the divers. To book snorkeling see our Cabo Pulmo Snorkeling. Compare At Our Price You Save! If you have the time (and the money), Cabo Pulmo is an excellent dive site - the best in the area. There are three kinds of coral here, the only ones you'll find in the Baja. It is possible that you'll get to dive with sea lions - there is a large colony near the dive sites. 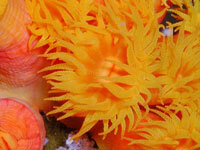 In addition, there are over 350 types of marine life in the park! Cabo Pulmo is about a 1.5 hour drive north of Cabo San Lucas.